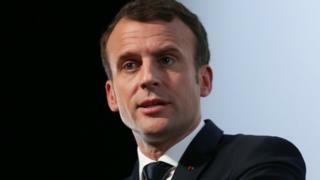 French President Emmanuel Macron has threatened to “strike” Syria if proof emerges that its government is using chemical weapons against civilians. “We will strike the place where these launches are made or where they are organised,” he told reporters. But Mr Macron said French intelligence had so far found no evidence that banned chemical weapons had been used. 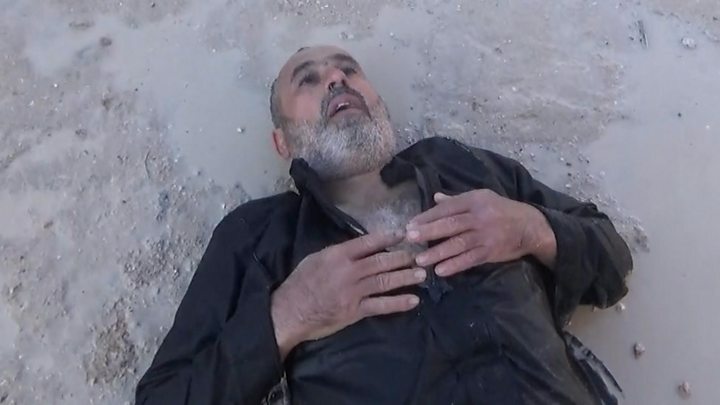 His comments follow numerous reports of suspected chlorine attacks in Syria since early January. Nine people were treated for breathing difficulties after a bomb believed to be filled with the chemical was dropped on a rebel-held town earlier this month. The Syrian opposition said a government helicopter dropped the bomb on Saraqeb, in the north-western province of Idlib. The Syrian government strongly denies using chemical weapons and says it does not target civilians. Speaking in Paris on Tuesday, Mr Macron reaffirmed his stance that the use of chemical weapons represented a “red line” for his government. “Today, our agencies, our armed forces, have not established that chemical weapons, as set out in treaties, have been used against the civilian population,” he said. Last year, Mr Macron told Russian President Vladimir Putin that the use of chemical weapons in Syria would be a “red line” that would draw an “immediate response” from France. In a telephone call with Mr Putin on Friday, Mr Macron expressed concern over “indications suggesting the possible use of chlorine” against civilians in recent weeks, his office said. Following a deadly chemical weapons attack near Damascus in 2013, the United States and Russia agreed a plan with Syria to remove and destroy its chemical weapons stockpile within a year. But the Organisation for the Prohibition of Chemical Weapons (OPCW) has continued to document the use of toxic chemicals in the country. In April 2017, an attack on the rebel-held town of Khan Sheikhoun left hundreds of people suffering from symptoms consistent with use of a nerve agent. Witnesses said they saw warplanes attack the town and shocking footage showed victims – many of them children – convulsing and foaming at the mouth. More than 80 people were killed. In response the US carried out a missile strike against a Syrian air base. They say an air strike hit a rebel depot full of chemical munitions. Reality Check: How much are countries paid for UN forces?